The 5th United Nations/ESA/NASA Workshop on Basic Space Science and IHY 2007 will be held around late September of 2009 in Korea. The United Nations, in cooperation with national and international space-related agencies and organizations, organized annually since 1990 workshops on basic space science, particularly for the benefit of scientists and engineers from developing nations. Drawing on nearly 15 years of workshops on basic space science, the United Nations Office for Outer Space Affairs, through the United Nations Basic Space Science Initiative (UNBSSI) will assist scientists and engineers from all over the world in participating in the International Heliophysical Year (IHY). At the 12th UN/ESA Workshop on Basic Space Science, held in P.R. China in 2004, it was recommended to focus future workshops on the preparations of IHY to be celebrated worldwide in 2007. 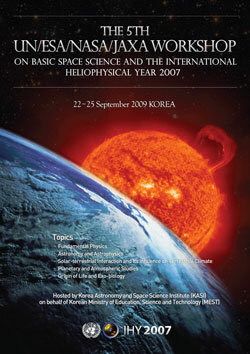 Comprehensive information on the International Heliophysical Year 2007 is available at official IHY WEB. Workshops on basic space science have been held in India (1991), Costa Rica and Colombia (1992), Nigeria (1993), Egypt (1994), Sri Lanka (1995), Germany (1996), Honduras (1997), Jordan (1999), France (2000), Mauritius (2001), Argentina (2002), China (2004). Since 2005, UNBSS has been organizing workshops on basic space science particularly focusing on the International Heliophysical Year 2007. The IHY-UNBSS workshop in Korea (2009) will be the fifth one after United Arab Emirates (2005), India (2006), Japan (2007), Bulgaria (2008). In 1957, in a display of unprecedented international cooperation, more than 60,000 scienists and engineers from 67 nations at thousands of research stations around the world participated in the International Geophysical Year(IGY 1957). The primary goal of the International Geopysical Year (IGY) was to study the global phenomena of Earth and geospace. IGY heralded the start of space exploration with the launch of Sputnik 1 in October 1957. It was also directly responsible for the United Nations General Assembly's interest in outer space and the establishment of the United Nations Committee on the Peaceful Uses of Outer Space (UN-COPUOS): the UN's primary committee that deals with the use of outer space for peaceful purposes. In 2007, fifty years on from IGY, scientists and engineers from all 191 Member States of the United Nations will participate in an international coordinated observation campaign on fundamental global questions of Earth and space science. The IHY will provide a unique opportunity to coordinate observations from the current impressive fleet of international space missions, with data from ground-based observatories. Unprecedented, simultaneous observations with broad coverage of all associated solar, heliospheric, geospheric, geospace and atmospheric phenomena will be obtained. The resulting data will allow global studies of the complete heliophysical system. "heliophysical" is an extension of the world "geophysical" extending the connections from the Earth to the SUn and interplanetary space. The activities of IHY 2007 will build on the success of IGY 1957 by continuing the legacy of system-wide studies. Data from IHY will be available to scientists and engineers of all nations, and the excitement of the scientific results will be communicated to the world through a series of press events and public lectures.